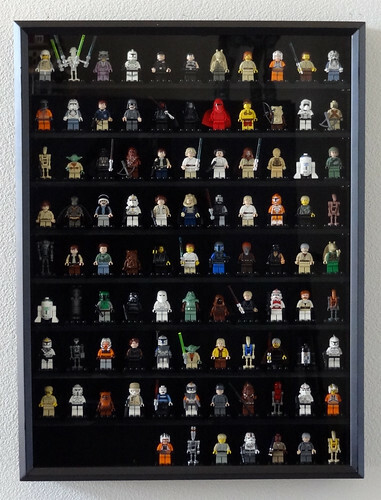 When I saw this great framing set up Artamir created to display his Star Wars minifigure collection I was not only impressed, but also reminded of this gigantic brick built one by madLEGOman. Unfortunately, my figs spend their days parted out and sorted (seperately from the non-SW figs at least), undisplayed and unenjoyed. I do have plans to renovate my basement and this concept may account for some of the wall space I've mentally set aside for memorabilia. 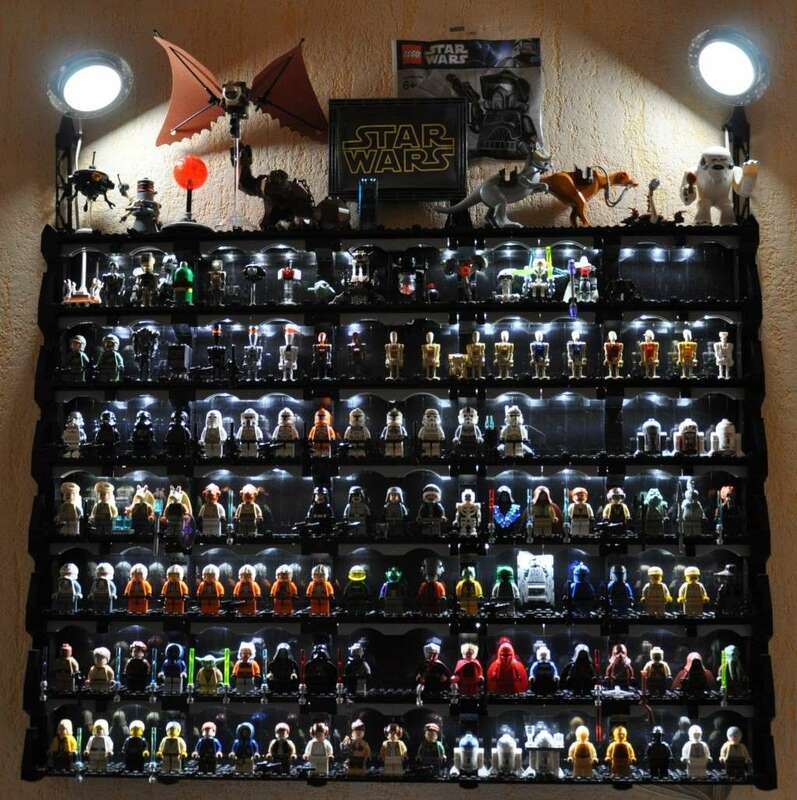 So show me how you display your figs. Ace already did a review on a LEGO display case and some folks were quite interested in that option, while others seemed to have their own set ups. Post a pic here and share your most cherished possesions with the rest of us. I mean the figs, not pictures of your kids. Great framing indeed from Artamir! Here is my display. 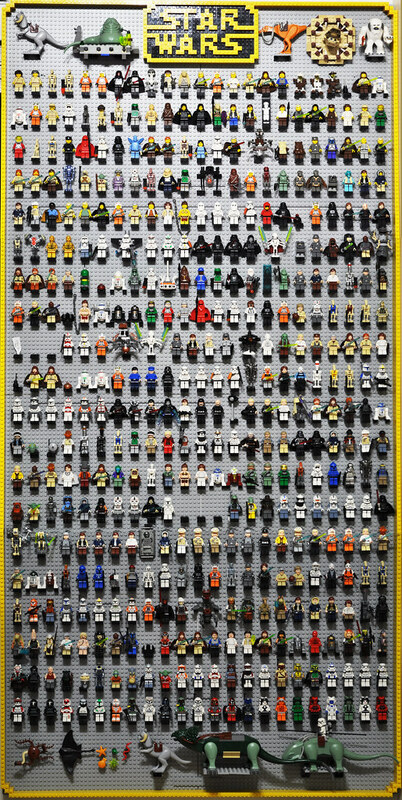 It contains (all) 512 minifigs including 57 key chains, 15 magnetic minifigs and 5 special bricks. Here is my display. I have a bad camera. It is just my iPhone, so the quality is just okay. I will try to get a better picture later. Here is a little bit closer view. 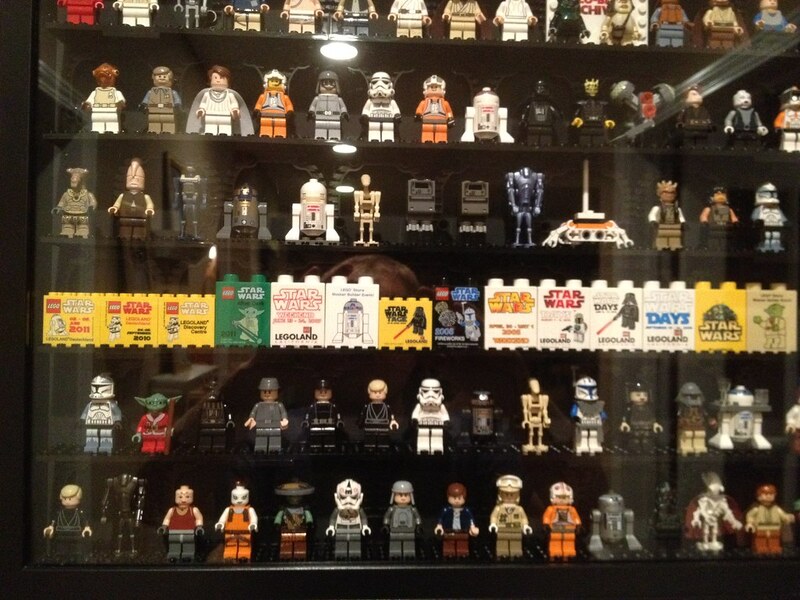 And here is a collection of all of the collector bricks that I know of. 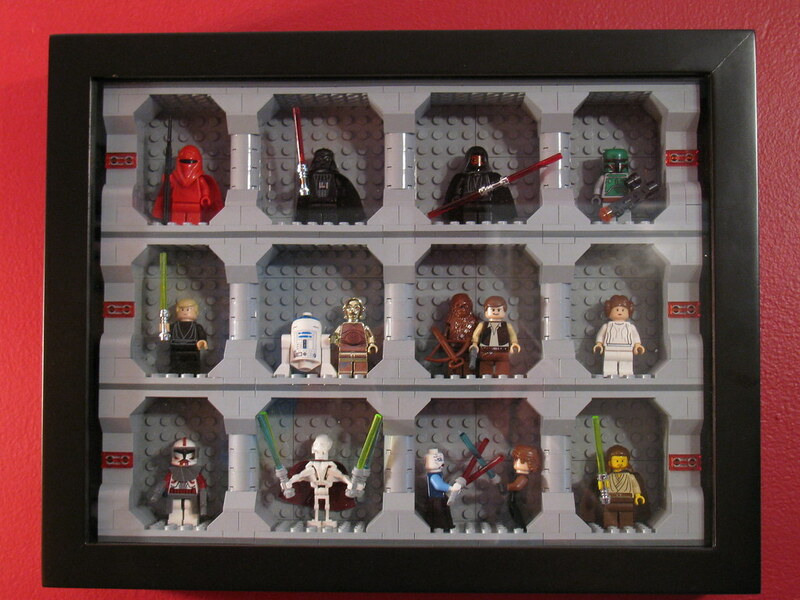 I customized some shadowboxes to display my Minifigures. This is the Star Wars case. I debated on whether or not to put all the similar models together - all the Luke's, Han Solo's etc like Artamir had done. But I think I prefer this random approach. Also, at my husband's request, I have only included unique models. The shadow boxes are from Michael's. With sales and coupons, each 18x24 case cost us around $25. I built shelves that are supported by LEGO bricks and acid free adhesives. 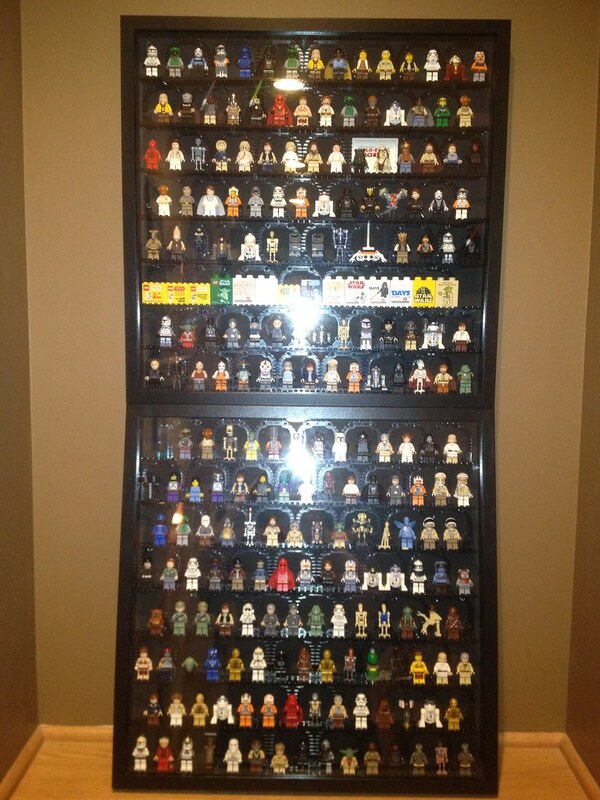 Each shelf holds 11 minifigures. 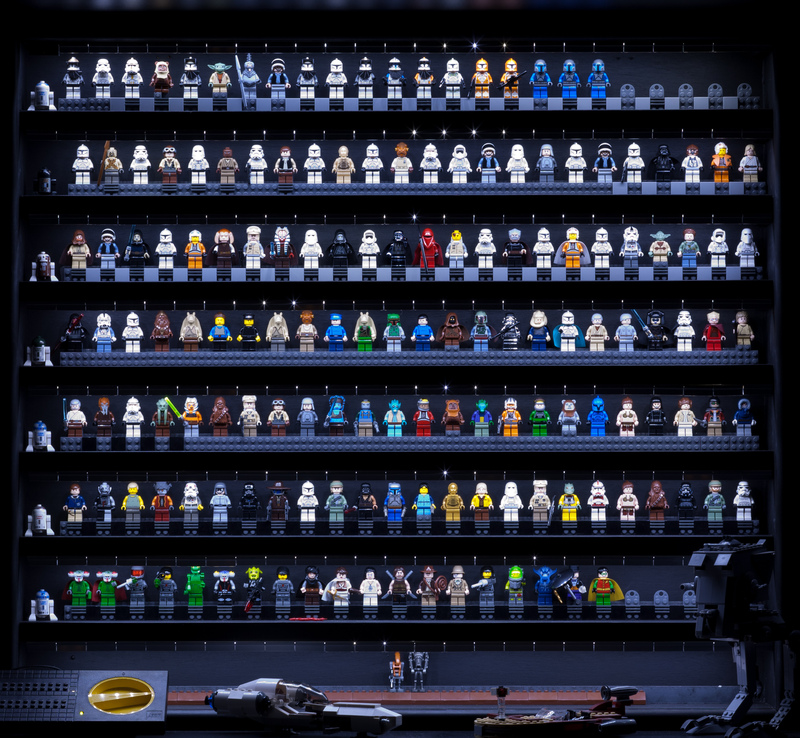 9 shelves for a total of 99 minifigures per case. How did you get to 512? 404 on Bricklink + 57 keychains + magnets? 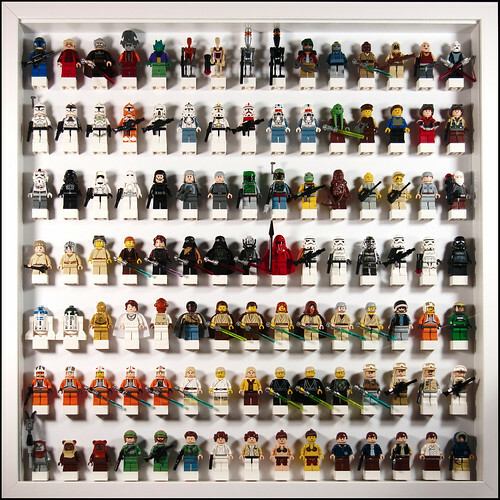 What do you have that is not on Bricklink? menq wrote: Great framing indeed from Artamir! Highly doubt you have the bronze Boba or the solid gold C-3P0. I don't believe anyone owns every figure. 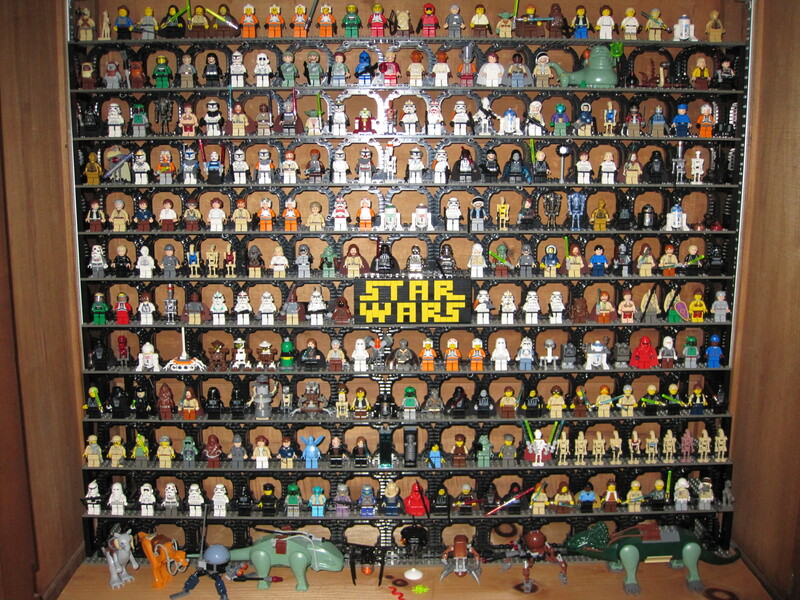 He also counts in: the same minifig with black eyes and the ones with white pupils, the normal versions with a black spot on the neck and the magnets without the spot, minifigs with a darker end lighter print like the old Yoda (Yoda magnet, Yoda darker and lighter torso), Luke from Jabba's Palace with cap and with blond hair while it's the same minifig that has both headgears in 1 set, factory faults with different legs, George Lucas prototype (at least I think he counts it), a normal and a dull print of Han Solo Carbonized andsoone. Shortly said, he is what you call a nitpicker. But, I do like his site, you can always look for a wanting list. 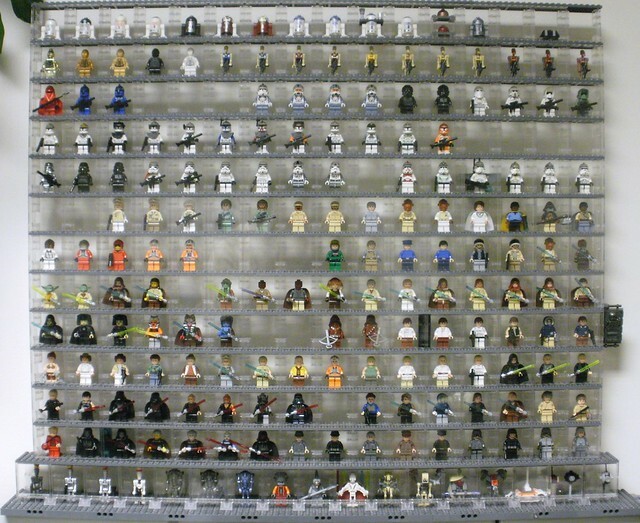 This was the picture several years ago that started me collecting the mini figures. I thought that it looked amazing. I wonder what he is up to now... This is not mine. It came from here. ohh and check out his one. Again, not mine, but it is from this guy. I am not sure I could afford to build a big one like this..., but it is a really good design. 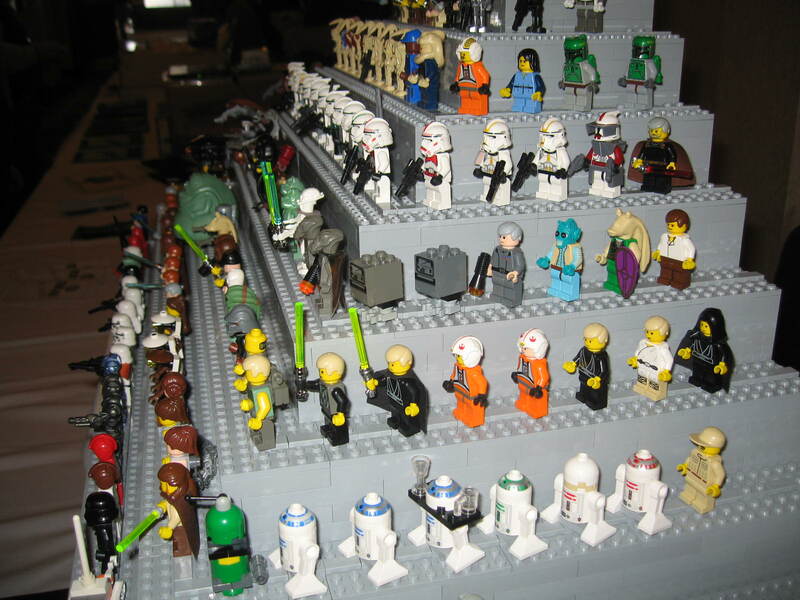 A nice display of custom figures. Not sure whos this one is. Here is a guy from germany. You can read about his collection here. You can see his description of what he built here.